As the last-minute, looking for the exit, bid to see more art at the Uffizi, we saw the Caravaggios hidden off in one of the more remote galleries. As with DaVinci and Michelangelo and so many others, it was so very cool to see Caravaggio in Italy. That's probably what most surprised me, how much I was affected by seeing all that art in its native homeland. 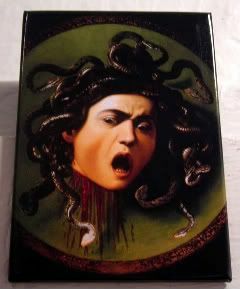 Caravaggio painted Medusa around 1597, and it's so very lifelike, it makes you take a step back for fear of turning to stone. Ok, ok, it wasn't as lifelike as all that, but you could certainly make out the gruesome sheen of blood spouting from Medusa's head in that dimly lit gallery. Totally creepy and scary. Which is fitting, because that's how I remember the classic 1981 Clash of the Titans fight between Harry Hamlin and the Gorgon Medusa. Scary. Sure, it was supposed be cheesy and crazy silly with the animatronics and greenscreen work of the day, but as a kid, I was totally freaked out by Medusa! So, when I heard they were doing a new Clash, and with my boy Sam "packed only my books when I moved to the States" Worthington, I could not wait. Seriously, having watched the trailer a few times, and had the giant 20-story billboard teasing me from up the street. Totally looking forward to it. It was my first movie in months! And, especially given how much technology's moved forward on the CGI/SFX front, I really thought the movie was gonna be amazing. And in 3D! That's why we went to the 11:45am showing at the Ziegfeld - which has, despite the lack of stadium seating, the largest screen in Manhattan. I should have known when the theatre had about a dozen people. Goodness. I love Sam. And Nicholas Hoult (Tony from Skins). And shoot, I even love Ralph Fiennes and Liam Neeson. But the movie? I did not love. It was just silly, and not in the way that classic Clash was silly. That was silly good. This movie was silly bad. So bad that I was entertaining walking out of the theatre, and would have, had I not spent $15.75, and have a thing for Sam's knobby knees, which for some reason, directors seem to focus on. They updated the story, revising storylines and characters, which was fine by me, and they had a couple of shout-outs to the old - with a great one to the mechanical owl of old. And I suppose the effects were great, too, even though sometimes, I felt like someone on the production side was a huge LOST black smoke fan, with a little dash of Harry Potter. The rest, though, was just terrible. I can always tell when something's bad, when I'm totally laughing at dialogues and scenes that I'm not supposed to laugh at. Out loud. To a deathly quiet theatre. But c'mon. With a line like "Ease your storm" in the mix, you can see why I did a fair amount of giggling. I mean, really. Who wrote that and said, yes, that's an awesome line! Who directed that and said, yes, that was a great take! Who acted that and said, hells yes, that's not cheesy at all? Ugh. Mind you, I'm totally stealing that line for everytime someone I know gets overexcited. I seriously can't wait. Sigh. Just like I couldn't wait for the movie to finally be over. Oh, not to worry, they're still gonna make money, if the $24mil they made off of Friday's box office has anything to say for it. No easing of the storm there. hey, ease your storm, buddy. it wasn't super bad, but it wasn't super great either. i WAS excited by the trailers, though. wish i was seeing any of those movies instead of clash. luckily we didn't see it in 3-D... even alice wasn't worth the 3-D. and they do like to show that sam's chicken legs. Ya'll know I rarely look at reviews before I go see the movies, so that I can make up my mind for myself. My problem with this, is that if I'd known they'd done the backassward 2d to 3d conversion, I wouldn't have paid for it. Clearly, I didn't know about it, even when writing this magnetpost, otherwise, you'd have another storm to ease! Grrrr.